With ProSlideshow Slides from Pixel Film Studios creating a stylistic slideshow has never been so fun and easy to do. Users can customize up to 7 3d slide drop zones, select from various amounts of fully customizable slideshow template animations, enjoy key-frameless animation, and more all with a click of a mouse all within Final Cut Pro X. 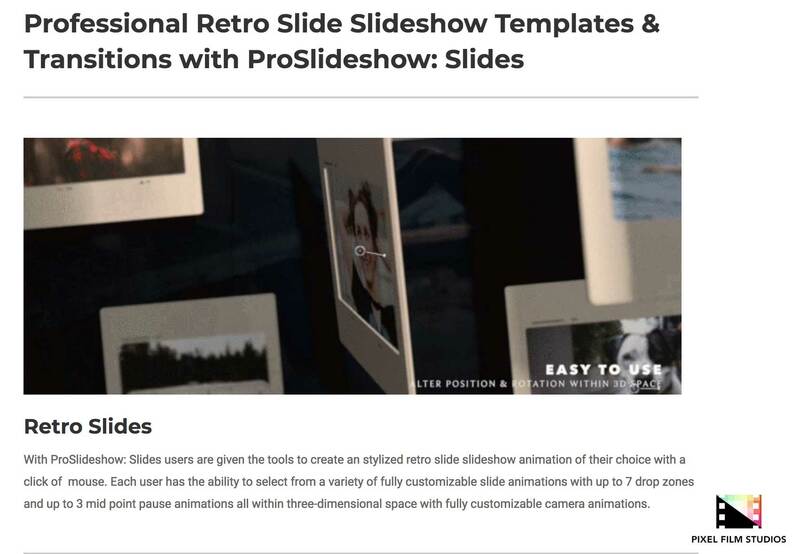 With ProSlideshow Slides users are given the tools to create an stylized retro slide slideshow animation. 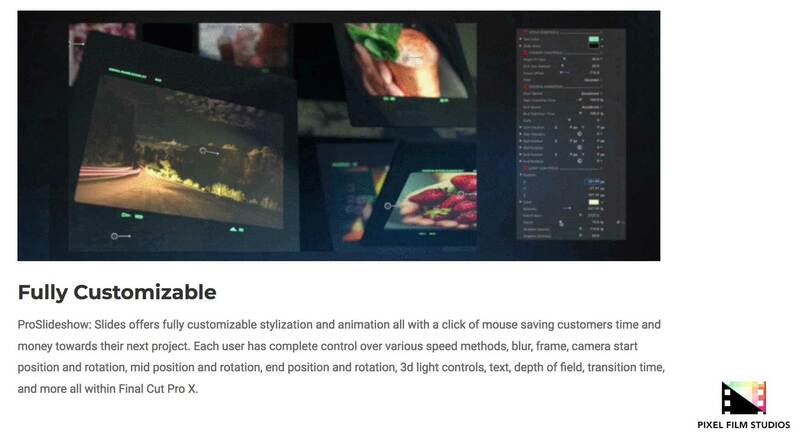 Each user has the ability to select from a variety of fully customizable slide animations with up to 7 drop zones and up to 3 mid point pause animations all within three-dimensional space with fully customizable camera animations. 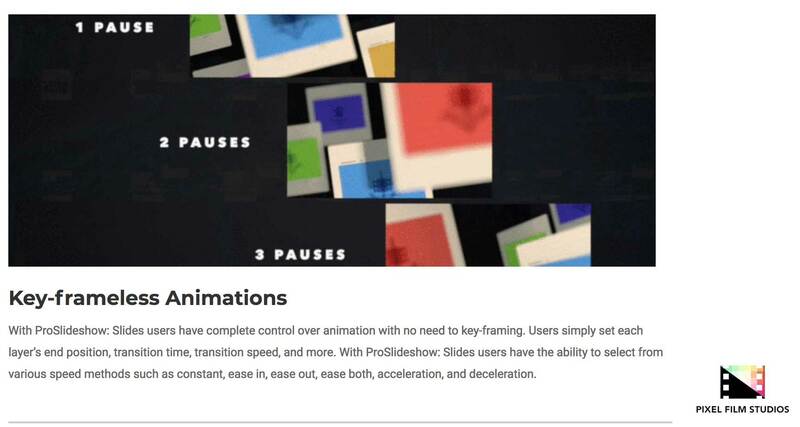 With ProSlideshow Slides users have complete control over animation with no need to key-framing. Users simply set each layer’s end position, transition time, transition speed, and more. With ProSlideshow Slides users have the ability to select from various speed methods such as constant, ease in, ease out, ease both, acceleration, and deceleration. ProSlideshow Slides offers fully customizable stylization and animation all with a click of mouse saving customers time and money towards their next project. 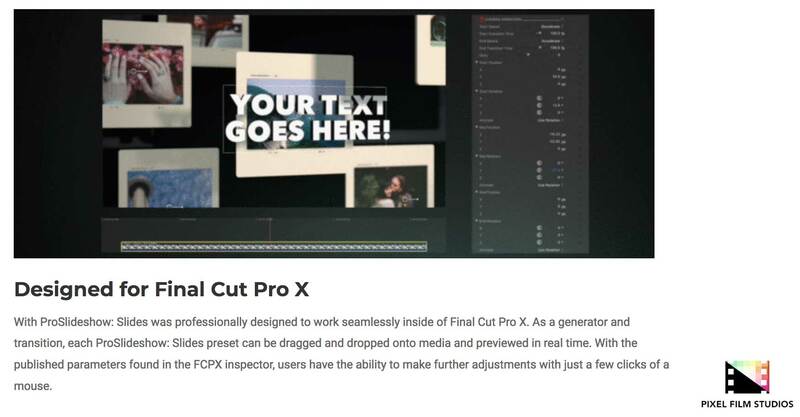 Each user has complete control over various speed methods, blur, frame, camera start position and rotation, mid position and rotation, end position and rotation, 3d light controls, text, depth of field, transition time, and more all within Final Cut Pro X.